Ha Long tourism may not be too strange to many visitors. So tourists have been travel to Ha Long by motorcycle to really discover and experience the interesting of this life or not? Origin Travel believes that exploring Ha Long by motorcycle will be extremely wonderful to make visitors remember forever. Follow Origin Travel to find information when traveling to Ha Long by motorcycle. Below, our team will guide tourists to travel Ha Long by motorcycle from the capital Hanoi. From Ha Noi to Ha Long city, there are two main roads, visitors can choose any route that they feel most convenient to start the journey Ha Long Bay. The nearest road is to follow: Route 5 to Sai Dong crossroad, turn towards Bac Ninh. From Bac Ninh, tourists go along Highway 18 through Pha Lai - Chi Linh - Dong Trieu - Ha Long. Alternatively, visitors can go towards Noi Bai Airport - Bac Ninh - National Highway 18A through Pha Lai - Sao Do - Dong Trieu - Uong Bi - Ha Long. In the experience of Origin Vietnam, visitors will be able to see the signs clearly and quite specific. But to be more active, Origin Travel has tips to travelers before the trip begins. Explore your way through Google Maps. Ha Long is an attractive tourist destination of Vietnam, so there are many hotels, guest houses, homestay ... meet all the needs from luxury to popular of travelers. With the tour Ha Long, Origin Vietnam Travel will introduce to travelers affordable and reasonable homestay. Address: No. 20, Cao Dat, Cai Dam, Bai Chay Ward, Ha Long. Kim Dung hotel is clean, rooms are beautiful and romantic. Room price is about 320,000 VND / night / person. Address: 108 Hau Can, Bai Chay Ward, Ha Long City, Quang Ninh Province. Doan Trang Hotel is close to Bai Chay Market and Halong Sun World Theme Park. Room price: 290,000 VND / person / night. Address: Tay Hung Thang Villa, Hung Thang Ward, Ha Long City. Venus Hotel is a hotel close to Tuan Chau beach, which will be quite convenient for guests to bathe in the morning every afternoon in Halong. Room price: 360,000 VND / person / night. You may also have other options for homestay accommodation. Address: No. 96, Area 58 6B, Ha Long Ward, Ha Long City, Quang Ninh Province. Room price: 115,000 VND / person / night. Address: 17T1 Green Bay Towers, 1616 Hoang Quoc Viet Street, Hung Thang Ward, Ha Long City, Quang Ninh Province. Room price: 400,000 VND / night / 2 people. What to do and where to go in Halong Bay? Perhaps, many visitors will find it extremely difficult to choose where to go and what to experience in Ha Long when the tourist city has so many attractions. Here, Origin Travel will help visitors gather the most worthwhile experiences when traveling Ha Long. Bai Chay is one of the beautiful beaches of Halong. Come here, visitors will be immersed in the blue water, cool. All will make visitors forget the fatigue, daily stress. Bai Chay is also a place to gather food and drink when traveling to Ha Long Bay. Especially when exploring Halong night market. Quang Ninh Museum is an architectural art. 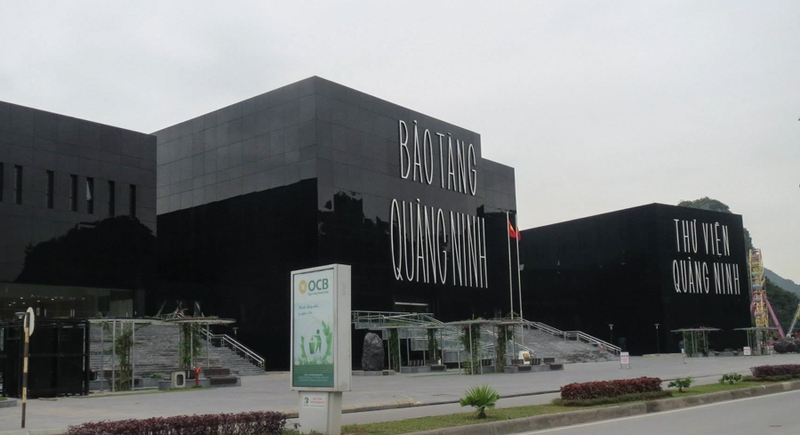 Quang Ninh Museum was inaugurated and put into operation in 2013. Until now, Quang Ninh Museum has become one of the tourist attractions with tourists both at home and abroad when traveling Halong. Ha Long Museum is the place to store all the quintessence of life, culture, history of Quang Ninh through the historical period. Tuan Chau is an island with many inhabitants and has appeared for ages. Tuan Chau is located on Ha Long Bay and is only about 2 km from the mainland. At present, Tuan Chau Resort has become a luxurious and modern resort of Quang Ninh province. Conquering Bai Tho Mountain promises to be a very enjoyable experience for visitors. Bai Tho mountain is only about 200m high so the challenge of conquering this mountain will not become too difficult or difficult. It takes about 30 minutes to get to the top of the mountain. 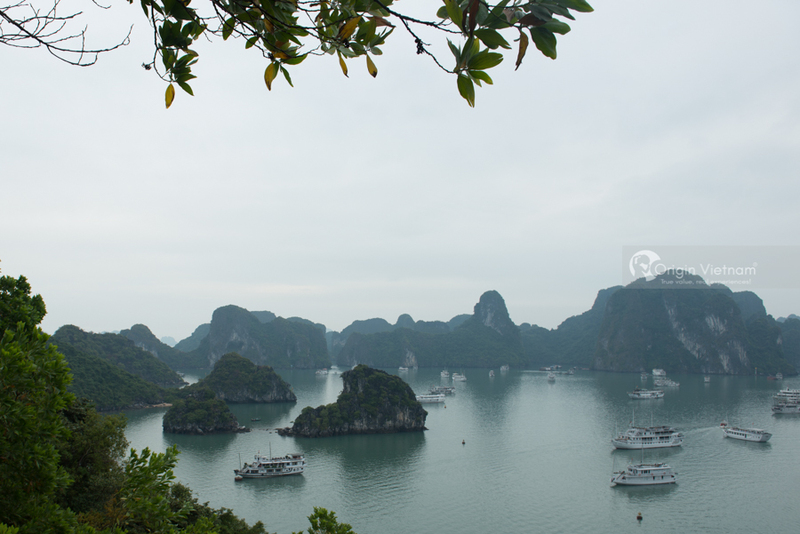 From here, visitors can admire Halong in the most complete and beautiful. Is not that so great? The best time to climb is in the early morning or late afternoon. This time the weather is not hot enough, visitors will lose strength. Moreover, this is also a great opportunity for tourists to watch sunrise and sunset in Ha Long. 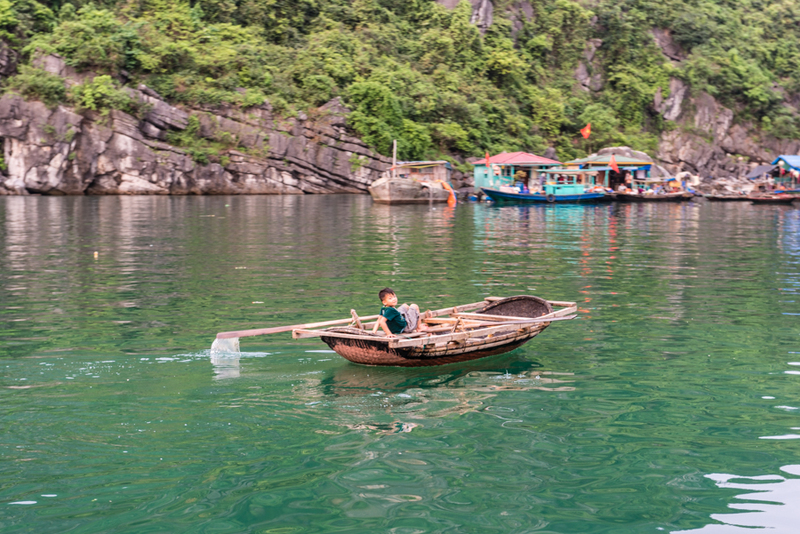 Especially, when traveling Ha Long Bay, visitors can not ignore the experience of Cua Van fishing village of Ha Long. This is the ideal place where travelers can find the most idyllic, peace of life, after the noisy, busy days. Cua Van fishing village features the scenery of the fishing village of Vietnam. Here, visitors will be able to observe the scene of daily life and activities of coastal fishermen. Ha Long Bay Tours will be one of the most exciting for all visitors when they have the opportunity to experience real life in fact not through books or movies. 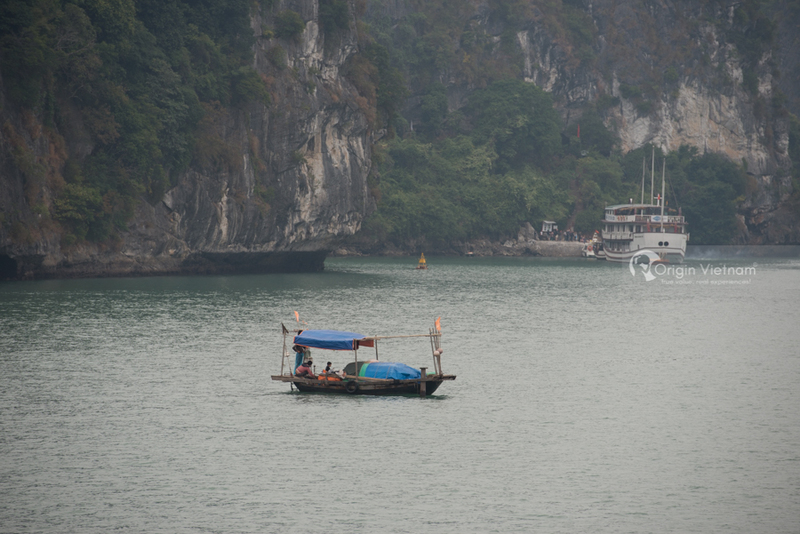 Ha Long is an ideal destination for travelers to discover and enjoy the most unique. The above is the sharing of Origin Travel information on the travel to Ha Long Bay by motorcycle. Hopefully through this article will help visitors more inspiration and confidence to carry a trip to Ha Long by motorcycle.